What fabulous fish and phenomenal plants! Wouldn't it be fun to have them all in your Aquarium? but getting your hands on those fish and plants won't be that easy! Like you, your opponents will stop at nothing to build their aquatic palace. Outwit your opponents and above all don't forget to feed your fish. After all, a floating fish is far less fun than a swimming one! 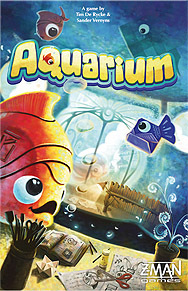 Reveal and buy new fish and plants! Make your opponents pay more for less!